Contractor and home builder of custom built homes in the Bethel, Sunday River, Newry, Rumford, Oxford and Andover Maine areas. 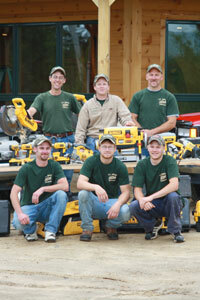 Jim Adler has been building custom homes in the Western Lakes and Mountains region of Maine since 1988. 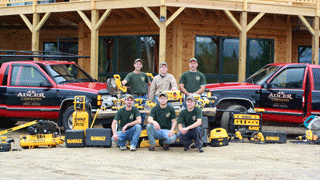 J. L. Adler Carpentry was officially founded in 1994. J. L. Adler focuses on building one home at a time. From start to finish, we sit down with you, design the house of your dreams, draw up the blue prints, and take care of everything to your exacting specifications. We usually will build your house in 3 – 4 months from start to finish. We personally can do all of the detailed woodwork inside and out in your home, even the hardwood flooring, cabinetry, finish, tile and mason work. If you are looking for an honest, detailed carpenter/home builder to build your dream home on time and on budget… call Jim Adler. Please review our gallery of homes and note we have built everything from simple cabins and capes to extravagant Mountain homes and Deluxe and Simple Log Homes. Fully insured. References readily available upon request. Please see - What to look for in a Builder Section of our web site. "One of the luckiest moments in our lives was when we found Jim Adler to build our house. Having been through both new construction and renovations we were wary at best when it came time to find someone to build our new home. From the beginning Jim was courteous and professional and we began to relax when it became apparent that he knew what he was doing. Then it just got better and better. Jim worked with us to fine tune the plans and once construction began (on time) he stayed with the project until it was finished. His custom work is extraordinary with a keen sense of detail. We trusted him completely with every aspect of the building process and of the many times we asked his opinion we always went with his suggestions. He would do things the electrician and plumber said couldn’t be done. Jim went the extra mile many times for us. ... We are so thankful that we were lucky enough to find him to build our home." Note: Every photo on this web site is of a home, fireplace, cabin, fence, etc. that Jim Adler and his crew built. No stock images were used in the creation of this web site. Call Jim to build your next project or dream home.